Today Nylablue goes to the vets to carry on with her treatment so we ask that you keep your prayers going for her,She is still here fighting the good fight to stay with us! 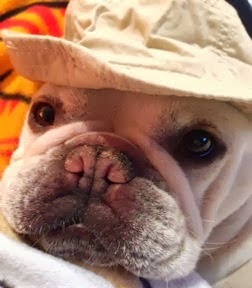 And please pray for our Pal Benny from Two French Bulldogs as his last chemo shot left him poorly and he had to stay in hospital. Benny is fighting like a Frenchie! These illnesses and spate of deaths in the pet blogging world are really getting us down. They are all in our thoughts and prayers. Have a wonderful Wednesday. 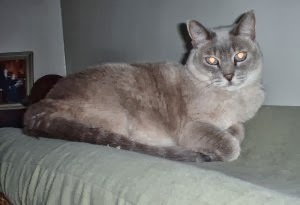 We sure are purring and praying for Nylablue and Mr. Benny. We are definitely keeping Nylablue, Benny and Brian in our purrayers! Get better, pals! Sending prayers. Hugs to those two. Poor little friends :( Too many sick pets this week! Rough days in blogville. My good thoughts with all in need. My thoughts and prayers are with both of them. Hugs and purrs. Sherri-Ellen & Nylablue here. We want to let Benny know we are praying for him & hope her will come home from the Hospital soon!!! Go Benny Go!!! As for Nylablue she IS STILL WITH US!!!! The Vet visit went well as we played her SEAL CD on the computer & it calmed her down some. She now weighs 8.59 lbs so has lost a bit more weight She had a Pepcid shot; Covenia shot (Antibiotic) & then a Depomedrol Steroid shot. We then gave her Mirtazipine orally to stimulate her appetite. She is eating now which is good because she has barely eaten all day. The Depomedrol will last 4-6 weeks. Covenia for 2 weeks. Pepcid for 4-5 days so Vet will have to come & give her more Sunday...thank you for all the prayers & support. It's certainly been a bad month in Blogville, Wishing them all a speedy recovery we're thinking of them and praying. Keeping everything crossed for them both! Our poor friends. We don't like hearing this and we are pulling for them. I know you and Mum Rachel keep in touch with Nylablue, I did post her FB update on my bloggy today after Mom Linda spoke on phone with Miss Sherri-Ellen. Ps can you email her to tell her "where" you saw that mistaken comment or post about our furriend Nlyla? Purraying for sweet Nylablue. Pawkisses.